Ian Woodward's Investing Blog » The Market Will Fool You Every Time! The Market Will Fool You Every Time! My thanks go out to all of you for your positive feedback. Just when I felt we had figured things out and the fans were leaving the ball game yesterday in droves…then would you believe it just before they all exited, the Bears fumbled at the 25 yard line and the Bulls have the ball again. Who said it was easy calling a top or a bottom? I know I said the “Party’s Over” yesterday, but there is always some fly in the ointment that can make things go the other way. That fly this time turns out to be an oversold market, and today we have a Bounce Play. I know most of you were in your foxholes and sleeping well, and those who are daredevils don’t care as they are nimble like Spiderman and avoid being a fool or a pig in the process! Fortunately the Game Plan I gave you at the weekend included looking at the potential of a Bounce Play, and after four hefty down days that had to be on the cards for today. Alternatively, look for Silverback Gorillas least hit for the upside scenario, should the market decide to give us a Bounce Play…don’t bottom fish now; it’s usually a waste of money. For those already in their foxholes last Friday, you have the most difficult choice as to whether to stay out or be a Jack-in-the-Box and tip toe back in. If you are long term oriented, then you will most likely want to see the dust settle and have no part of this yo-yo market. Those who are swing-traders are the ones who must now be extremely disciplined in your approach, as they are the ones who can get caught in a Weak Bounce only to find they must get out fast. For sure you should have noticed that the Asian and European Markets had taken a breather and arrested the big downfall last night. I told you the Chinese Silverbacks I gave you were down 19% from 9% the day previous…one had to expect a total rot set in yesterday or they would halt the rout and these very beaten down stocks would be the tasty morsels for today. The same could be said of the Gorilla RonIandex so your game plan had to look for entries here first thing this morning, and/or your favorite stocks which you had vacated previously with a good taste in your mouth. However, at all cost you cannot have a split personality. You are either in for a day-trade or at most a two-day trade counting today, (Friday is three days away and you know everyone will be vacating on Friday). Furthermore, you can’t dilly-dally on the way. Recall my saying “The Early Bird catches the Worm, but look out for the Hawk above!” Always try to figure out what your Competition’s next step will be…if you are a Bear, how do you protect your winnings from the last several days and if you are a Bull, where is the next trap my competition will set for me? I can’t cover all these points in a two page blog, but you get the gist of how you must think before you buy today, Tuesday. You know that every Technical Analyst under the sun has already concluded that most of the Indexes have developed a Head and Shoulders Top, so the most likely call will be wherever this Bounce Play peters out for them to take another stab at shorting. If you are accomplished Day Traders then forgive me as you folks can take care of yourselves, but my thoughts are directed to those who have done extremely well this year, especially one person sitting in sunny Alabama and another in sunny Dallas who wrote me notes of encouragement, and I know the temptation must be there to hop in again. Net-net, don’t get caught between two stools! 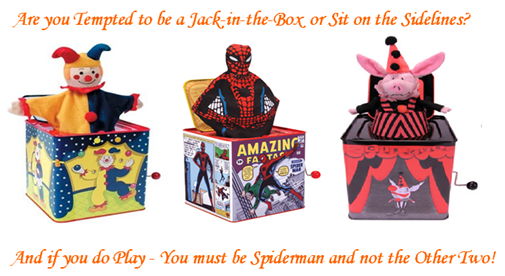 Act like Spiderman and use his trump card which is “Nimble”. He who hesitates is lost. With all that said, of course they are right back in the beaten down Gorillas with the RonIandex up 5.31% for the day based on 100 share lots. I also gave you a winky-winky last night…they are heavily into “C” Accumulation stocks today, i.e., those which have solid earnings reports but buying pullbacks! DRYS heads the list! All 25 stocks are green for a gain of ~4%. I trust I gave you a way to focus on a concept. Most of you use QuoteTracker, so here is what I keep a beady eye on to see which way the wind is blowing in this current market. You have to act early/quickly, or you get left behind. This entry was posted on Tuesday, November 13th, 2007 at 5:16 pm	and is filed under HGS Principles. You can follow any responses to this entry through the RSS 2.0 feed. Both comments and pings are currently closed.